Gordon Mayes was born on March 19, 1951, to Ernest and Evelyn Mayes. 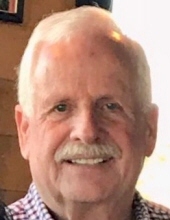 He met the Lord in heaven on November 6, 2018, following a heart attack at his winter home in Tucson, Arizona. Gordy was an excellent husband, father, businessman and friend. Family meant everything to Gordy and he prayed daily for his children, grandchildren, and future grandchildren. He measured his actions by how God would view him and told his family to “Always make the next right choice.” He reminded his family “God is not done with you yet.” Above all, he wanted to make God proud and be welcomed into heaven with, “Well done my good and faithful servant.” Gordy was such an inspiration. He found the beauty in God’s creation daily and loved his work as owner of E.R. Mayes Blacktop Paving. As a young man, Gordy was a Young Life counselor. He started a club at Peoria Central High School, led songs, and took kids on trips to Young Life ranches. He touched many lives in this role and made life-long friends. As a business owner of ER Mayes Construction, he loved meeting and becoming friends with so many nice people. Gordy especially enjoyed the creativity and travel his work with StreetPrint paving allowed. A true highlight in Gordy's later career was his work testing heavy equipment at the Caterpillar Proving Grounds. In semi-retirement, Gordy continued to consult, estimate, and project manage construction projects in the Peoria area. His favorite passages included Jeremiah 29:11 and Isaiah 40:31, which were his compass. Following the death of his first wife Connie Mayes, Gordy remained strong, adopting the mantra: “God doesn’t make mistakes.” He prioritized raising his daughters, Kelli and Heidi, while running a business and playing Mr. Mom. He gave his daughters the lifelong gifts of learning how to trust God and finding strength in all situations. Gordy married Lynn Duvendack Blackburn in January 1997 and enjoyed his stepfather role to Lee and Laura Blackburn. He loved gardening, riding his motorcycle, going to fun places and getting excited as he and Lynn explored together. They loved to take long walks enjoying nature. Gordy frequently remarked about the beauty found on these walks asking, “If God made such beauty here, imagine what Heaven must be like!”. His enthusiasm was contagious, inviting you to seek beauty in everyday things as well. Gordy will be missed tremendously. We are so proud of all he was able to accomplish and the lives he touched in his time with us. Good job, Gordy Mayes! Gordy is survived by his wife, Lynn Mayes; his father, Ernest; brother Steven; his children, Dr. Kelli Mayes-Denker (John), Heidi Mayes, Lee Blackburn (Colleen) and Laura Crabtree (Zachary); grandchildren Loki, Egan, Wyatt and Nicky the cat. Gordy was blessed to be able to spend time with family in both Peoria and Tucson. He will be cremated and his ashes will be spread in the Arizona mountains he loved so much at a later date. A memorial service will be held on Saturday, November 17, 2018 at 1 pm at The Wilton Mortuary in Peoria. Visitations will be held on Friday, November 16, 2018 from 4 pm to 7 pm and Saturday, November 17, 2018 from 12 pm to 1 pm, also at the funeral home. Please send donations to Casas Church in Oro Valley, Arizona. "Email Address" would like to share the life celebration of Gordon Mayes. Click on the "link" to go to share a favorite memory or leave a condolence message for the family.